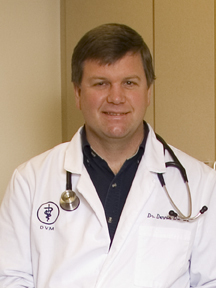 Dr. Diemer has been practicing veterinary medicine since 1990. He has been with Prairie View Animal Hospital since 1992. He grew up in rural Hampton, IA and attended Iowa State University where he received his BS in Animal Science in 1986 and his DVM in 1990. Dr. Diemer's veterinary interests are in laser surgery, geriatrics, and oral surgery. Some of his hobbies include fishing, landscaping, racquetball, scuba diving. Dr. Diemer and his family - wife Peggy and daughters Sara and Jennifer reside in rural Sycamore with their dogs Mia, Kobi, and Ariel and their cat Annie. Dr. Emmert has been practicing veterinary medicine since 1989. 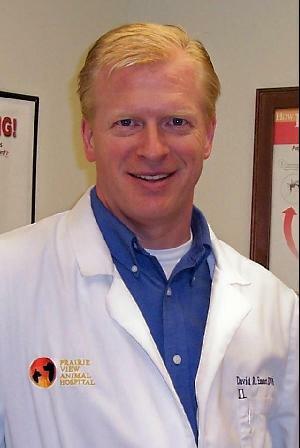 He has been with Prairie View Animal Hospital since 1990. He grew up in Geneseo, IL and attended Iowa State University where he majored in Dairy Science. He received his DVM 1989. Dr. Emmert was a member of Alpha Gamma Rho and Alpha Zeta while at Iowa State. Dr. Emmert is actively involved in the community. He is the charter member of the Kishwaukee Sunrise Rotary, served on the DeKalb County Board of Health from 1993-1998, and participates in the American Heart Association-DeKalb County Heart Walk. Dr. Emmert enjoys participating in endurance events such as marathons, half marathons, and triathlons. He also enjoys fishing, boating, traveling, and sports (Cubs baseball, Bears football, Iowa State and Northern Illinois football). Dr. Emmert, his wife Sheri and their 4 children - Dani, David, Claire, and Caden reside in Sycamore with their Golden Retriever Cali and their Labrador Retriever Ava. Our Doctors each have over 20 years of medical & surgical experience. They are always striving to learn more & challenge themselves. Please feel free to call our office at (815) 756-9976 to learn more about our doctors or to schedule an appointment with them.